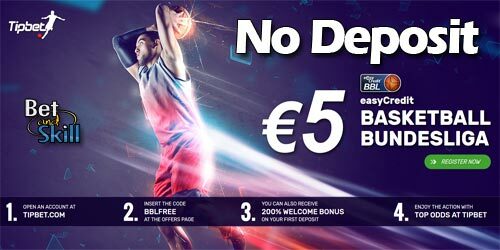 New bookmaker Tipbet has just signed up as a sponsor of the easyCredit Basketball Bundesliga, and to celebrate they are giving BetAndSkill readers a €5 no deposit free bet! Open a new account via our special links, you will automatically receive a €5 free bet which can be used on any Basketball event. Do you like to bet on Basketball? Get a no deposit bonus to use on the German Bundesliga with Tipbet. Enjoy you free €5 with no deposit needed at Tipbet.com and keep your winnings! 6. Enjoy the action with Top Odds on the German Basketball Bundesliga! The five Euro (€5) bonus will be credited to customer’s account by entering the code “BBLFREE” at the Offers section under Account Summary. The bonus amount needs to be rollover fifteen (15) times in Basketball pre-match and live betting only. The bonus amount can only be used for Basketball bets on Basketball events. In order to place other bets, to transfer the amount to other wallets or to request a withdrawal with this bonus or responding winnings of this bonus, the rollover requirements have to be fulfilled. With this bonus active, applicable and relevant Basketball bets will be placed in whole or in part with the bonus amount in first order. Only one selection per Basketball event is eligible for bonus turnover requirements. If two or more bets are placed on a different selection of the same Basketball event, only the stake of the first selection made, will be added towards the turnover requirements. The 5 EUR Basketball Bonus requirements left are displayed under the tab “Bonus” in the “Account Summary” section. This Bonus cannot be used in conjunction with any other promotion, bonuses or special offers. The 5 Euro Basketball Bonus must be depleted to be able to use any other permitted Tipbet promotion, bonus or special offer. Any try or completion by a customer of using an arbitrage model or any other patterns and methods that guarantee earning winnings will be assessed as abusive behaviour pursuant to Tipbet´s Terms and Conditions. Transferring any amount to any other available product of Tipbet before the fulfilment of the turnover requirements is not permitted. This bonus is limited to one account per person, family, household or computer. By suspicion of abuse via multiple registrations, Tipbet.com reserves the right to remove the bonus and any resulting winnings. The Tipbet Basketball Freebet Bonus is only eligible for customers residing in Germany, Austria, Malta, Sweden, Switzerland, Luxembourg, Norway, Belgium, Netherlands, Finland and Iceland. This promotion is valid until further notice. Tipbet reserves the right to change or cancel this promotion at any time without prior notice. The customer will be deemed to have accepted the new terms in the event that the bonus is availed of after the change. Additionally to these terms, Tipbet’s Bonus Terms and General Terms & Conditions apply. "Tipbet €5 Free Bet No Deposit on German Basketball Bundesliga (Bonus Code: BBLFREE)"